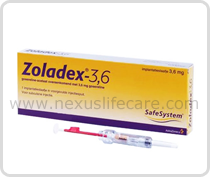 Zoladex Injection distributors, dealers & suppliers in Mumbai. •	Breast cancer that is advanced. Zoladex Injection is used as palliative treatment in premenopausal andperimenopausal women. •	Prostate cancer. Zoladex Injection is used with flutamide and radiation therapy in localized prostate cancer. Zoladex Injection is also used as palliative treatment in advanced prostate cancer.